This relatively young lawn brand is quickly attracting a strong following with what is merely their 2nd collection launch. Rungrez brings to you their latest Spring Summer 16 collection that embodies the full-of-life, breezy feminine aesthetic in the true sense. A series designed to elevate the traditionally evolved woman who has an incredible but understated sense of style. Elegance conveyed with a soft and delicate palette with lots of detail including swarovski crystals and ample lush embroideries. 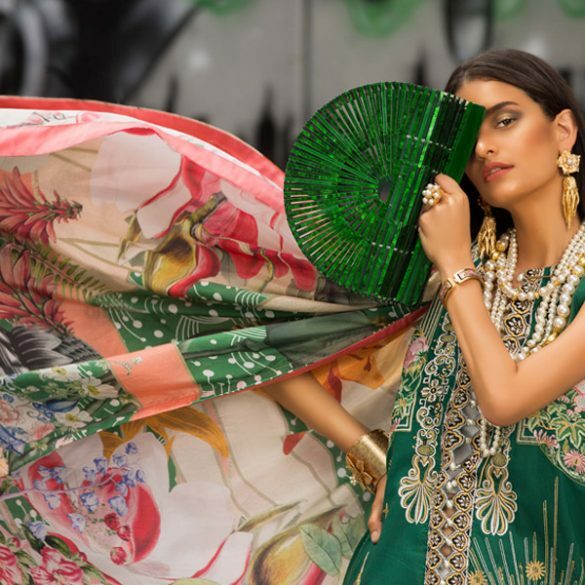 The collection features beautiful creams, skylight blue, pinks, greens and the classic black and white which are amalgamated with intricate hand worked embroidery and artistic nature imagery. The floral prints blended with similar embroidered thread-work add to the three dimensional effect and ensure that each piece stands out for its individuality. Each ensemble comes with vibrant printed dupattas and textured pants with full embroidered motifs that can be styled in versatile ways to create gracefully unique looks. We’re certain that this breezy collection will blow you away. The red carpet launch will be held at the Nishat Hotel Lahore today 5th March with the official release nationwide from 7th March in fabric stores and online from today for shipment and delivery at the Rungrez Estore. Exhibition Hit List: 'Zeenat Aman' by Mina Siddique Opens 5th March!